Our Boston Organ Crawl started on a cool, overcast Saturday morning at the The Mother Church - headquarters of the Church of Christ, Scientist - in the heart of Boston. The elaborate domes and arches of this massive building, which lies just across the street from Symphony Hall, were surrounded by much construction and maintenance work. 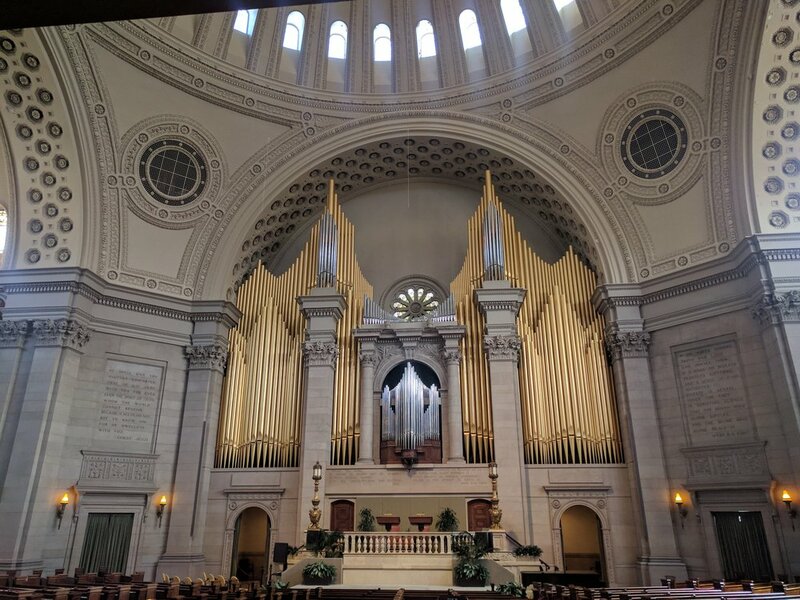 But despite the iconic reflecting pool and plaza being under a shroud of noise and dust, an air of excitement engulfed us as we met Stephen Loher, a longtime church member and organist, who took us into the building. A short elevator trip from the impressive marble-laden foyer greeted us to the main space of the church. With no view-obstructing pillars supporting the Byzantine dome, the organ facade immediately came into full view. One of the most beautiful and impressive in the United States, the broad gilded facade of this Aeolian-Skinner instrument elicits a sense of silent power and awe, in harmony with the building itself. Of course, this silence was quickly broken as, following a brief introduction of the organ and it's history, Stephen took us on a “color trip” of the organ. 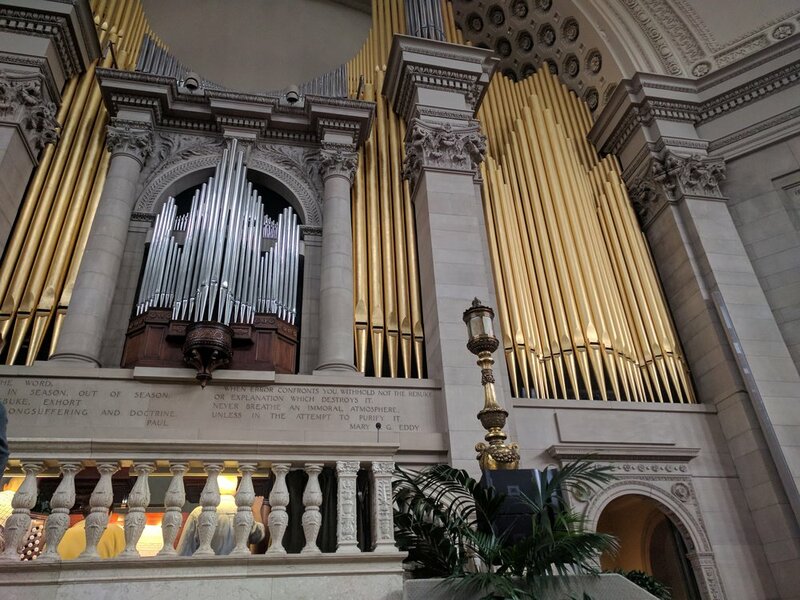 Being the 9th largest pipe organ in the world [13,389 pipes in 235 ranks, 172 stops, 7 divisions, 4 manuals and a pedal board] this trip was incredibly dramatic, moving from lush strings, through powerful principles and sparkling flutes, to incredibly clear trumpets, horns and other reeds. And yet, at it's end Stephen mentioned he had gone through a mere tenth of this instrument's seemingly endless combinations. This listening experience, together with the façade and enormous console, revealed an incredibly eclectic instrument. In fact, this was a primary purpose in its making – to be able to play music from all over the world, and from different periods of time. We then went through a small hidden door under the center podium, through a small room, into the console area. One by one we sat at the console, overwhelmed by the amount of stops, pistons, and couplers. Where to start? What to play? 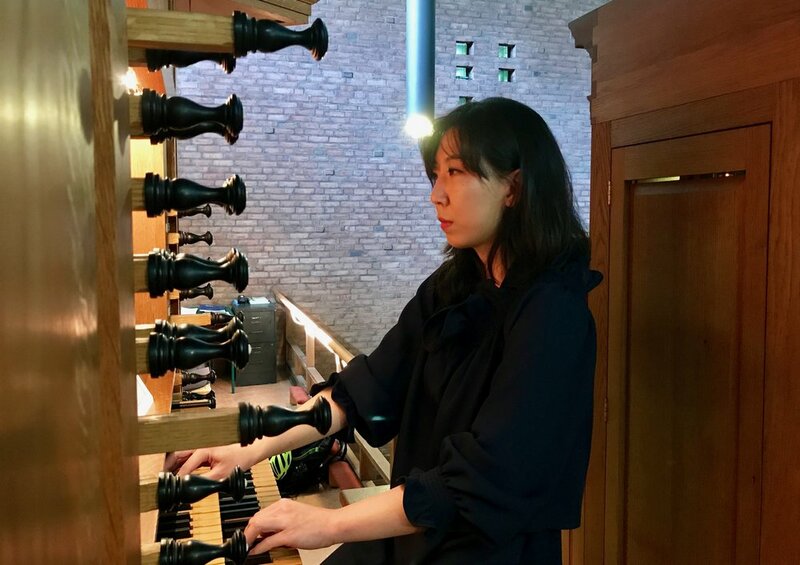 After over an hour of playing, it seemed our different musical choices reflected the propose of this instrument well, and exposed us to a world of new sounds many of us hadn't experienced before. Leaving the mother church, the dreary morning weather had turned into a hot, sunny day, and we marched on to have lunch together at a Back Bay Italian restaurant. After a carb-full meal (for most) we continued to First Lutheran church, also in Back Bay. There, we were greeted by the church’s resident organist, Jonathan Wessler. Jonathan was very enthusiastic in welcoming us, and gave us a brief account of the instrument’s making. 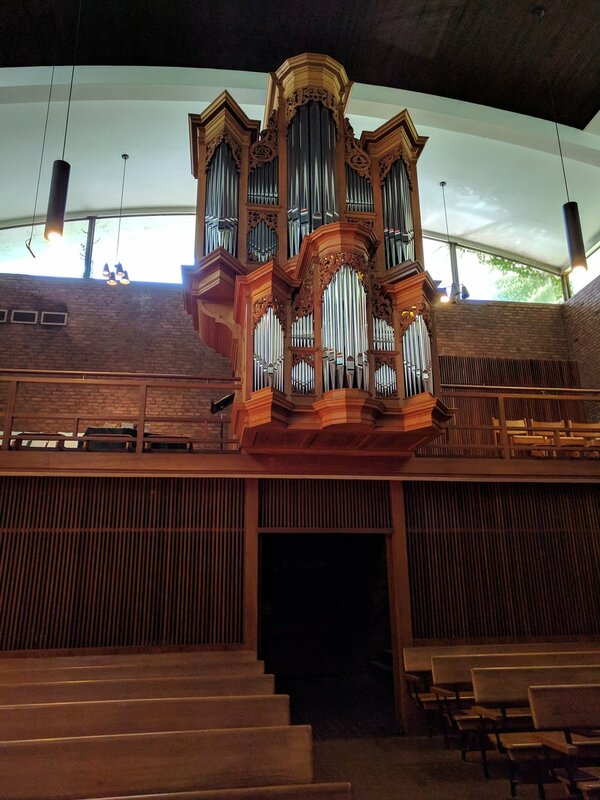 This organ, considered by many as one of the best in town, was built by Richards, Fowkes & Co. to mimic the north-german baroque style. We were all taken by its beauty, and how it merges with the clean, almost spartan lines of the church’s interior. Jonathan then gave us a Tour de Force of the organ, demonstrating and explaining not only the different stops, but also many unique stop combinations. 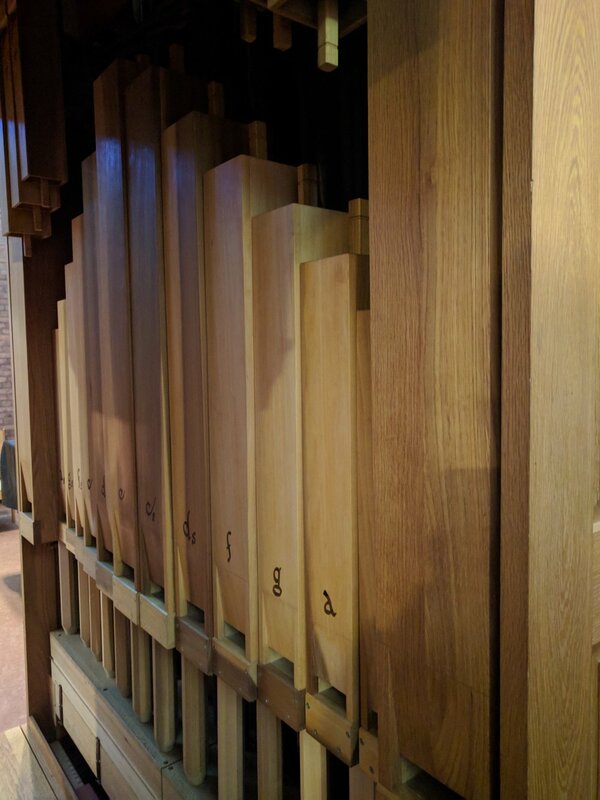 The contrast with the Mother Church organ was stark, as this is a very focused, period instrument [full mechanical action, 27 stops, 3 divisions, 2 manuals and a pedal board]. Here, every rank speaks in full, rich tones which are as pleasing alone as they are combined. We then joined our host at the console and each had a go and played a piece or two. Meanwhile, Jonathan left the cabinets of the organs open, so that its mechanical action and pipes were exposed and we could observe its innards while others were playing. 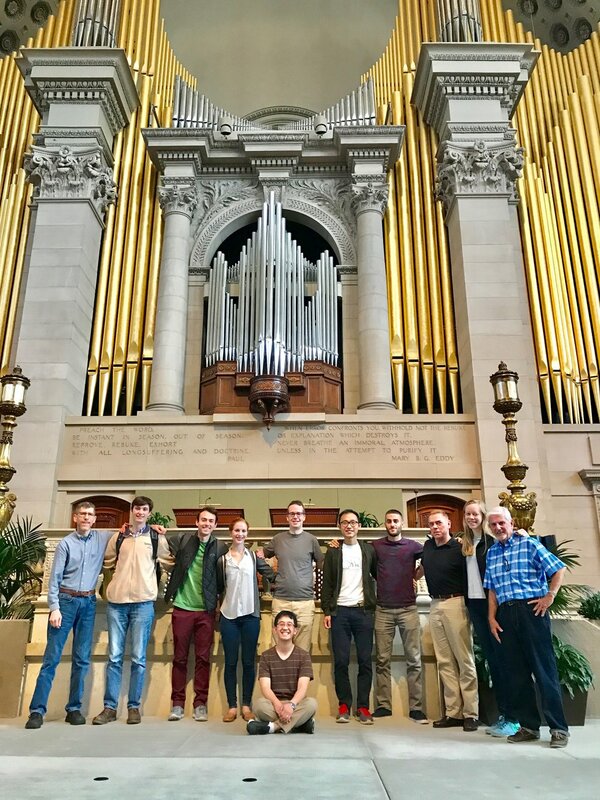 Overall, Jonathan’s excitement and knowledge of the organ together with the instrument’s magnificence had made this visit a real treat for all of us. We finished our tonally-rich day with equally rich ice cream in Beacon Hill, and then marched to the Common to enjoy the last hours of sun on the grass. Stephen Loher assists Dennis Chan at The Mother Church. Boston Organ Studio. Stephen Loher assists Julia Kornick at the console of The Mother Church organ. Organist Dor Amram plays at First Lutheran Church. Boston Organ Studio. Organist Kade Phillips plays at First Lutheran Church. Organist Emerson Fang plays at First Lutheran Church, as Jonathan Wessler looks on. Boston Organ Studio. 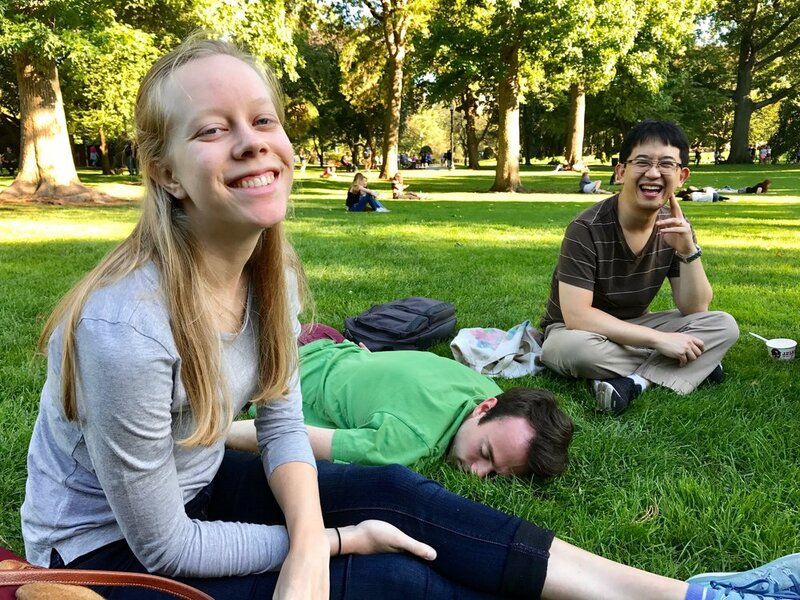 Laura Gullett and Emerson Fang enjoy the sun in Boston Public Garden.